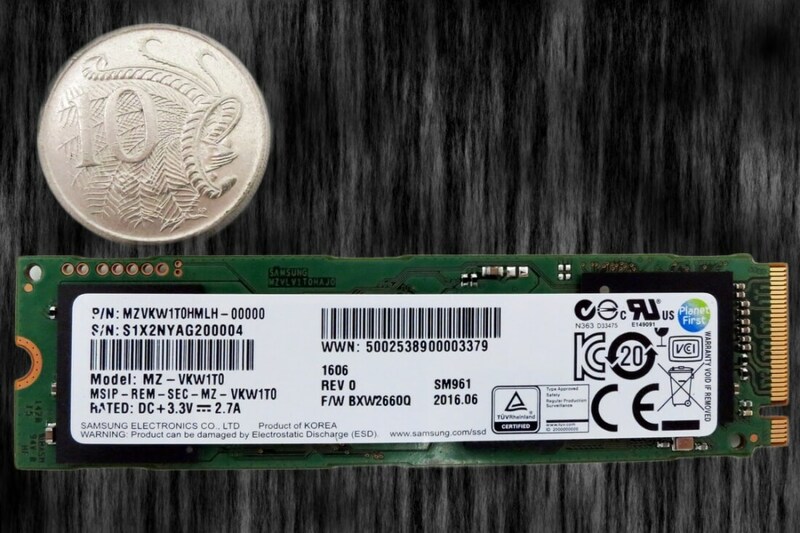 Samsung's follow-up to the excellent SM951 NVMe SSD is set to arrive next week. The new SM961 will be an OEM product meant to ship primarily inside high end systems, but as with its SM951 and XP941 predecessors there will be distributors selling the drive as well, and now specs and pricing details for the upcoming lineup are popping up online. The SM961 will ship in four capacity sizes: 128GB, 256GB, 512GB and 1TB -- this is Samsung’s first NVMe M.2 SSD to hit the 1TB mark. The drives feature Samsung's new Polaris controller which should bring some performance improvements and help minimize heat output. The SM961 is also expected to use third-gen 48-layer V-NAND to achieve larger storage capacities in the same tiny package, but this hasn’t been confirmed by Samsung, and AnandTech reports the newer memory hasn't made its way to existing product lines. Both 128GB and 256GB models have sequential read speeds of 3,100MBps, while the larger 512GB and 1TB versions go up to 3,200MBps. Sequential write speeds top out at 1,800MBps in the largest drive, dropping to 1,700MBps for the 512GB version, 1,400 MBps for the 256GB drive and 700Mbps for the 128GB. In terms of pricing, a now-removed listing on Australian site RamCity had the 256GB version is priced at $159, the 512GB version at $280 and the 1TB drive priced at $512. Those prices on par with the best deals currently available for the SM951, and undercut retail NVMe M.2 drives like the the Samsung 950 Pro and Toshiba OCZ RD400 by $15 to $40 or more. There’s no pricing information for the smaller 128GB variant so it’s likely we won’t see this drive used outside of the OEM and system integrator market.